When you take stock of everything going on here, there appears to be no chance for success. There's a bunch of Monitamon with no concept of what's funny. There's a relaxed boss who would just assume catch up on his TV than pressure the locals into surrendering the code crown. 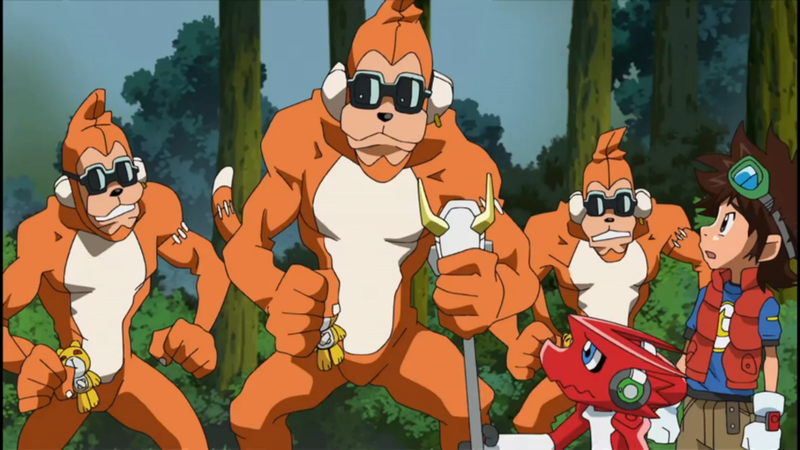 The team is surrounded by Etemon. Claiming the code crown involves a bunch of not-really-funny skits, which undoubtedly involve bad Japanese puns that are a labor to dub into English. This one has disaster all over it! Give the dub credit: they made it through this one intact. It wasn't a great episode to begin with, but there were so many ways the dub could have made it much worse. Instead, it was up for the challenge and handled the tricky parts well enough, while retaining/adding enough humor to make a ridiculous episode like this work. In fact, parts of the first half were executed so well that it made the critical skit that actually made Karatenmon laugh disappointing by comparison. That's the trouble with dubbing manzai skits. It's a straight man-idiot format that's so rigid and choreographed that I've yet to see a dub actually make it funny to an English-speaking audience. The result leaves us wondering why Nene's bad puns and awkward reactions got Karatenmon snickering. Maybe it was the forced slapstick. It's an odd way to punctuate an amusing episode. AxeKnightmon continues to be missing from action, presumably off hanging out wherever Beelzemon went. It leaves us waiting for the plot to pick up again, and while there's no excuse for that, at least the interim entertainment comes through. The closest thing the zone has to an actual boss, Musyamon, had no place here and was written out in clever fashion. The Monitamon are simultaneously cute and hopeless and will be the first ones contacted if Ninja Nonsense has another season. Etemon's presence feels like acknowledgment that he was a sorry joke of a villain, no matter how effective and threatening he actually was in Adventure. And Mikey's Shoutmon/Sparrowmon fusion was comically terrible (we should all be thrilled to see him actually screw something up), while his Ballistamon/Beastmon fusion was comically brilliant. What lifts this out of Digimon's heap of silly, meaningless episodes is that it delivers two important character notes for the price of one. Part of it is Nene being permitted to have a sense of humor. She arrives fatigued and distraught over her brother, something that prompted their visit here but is quickly forgotten. Her downbeat attitude is soon the only problem, but it is a problem: she's not going to be very effective in that state, and it's not going to be any fun. 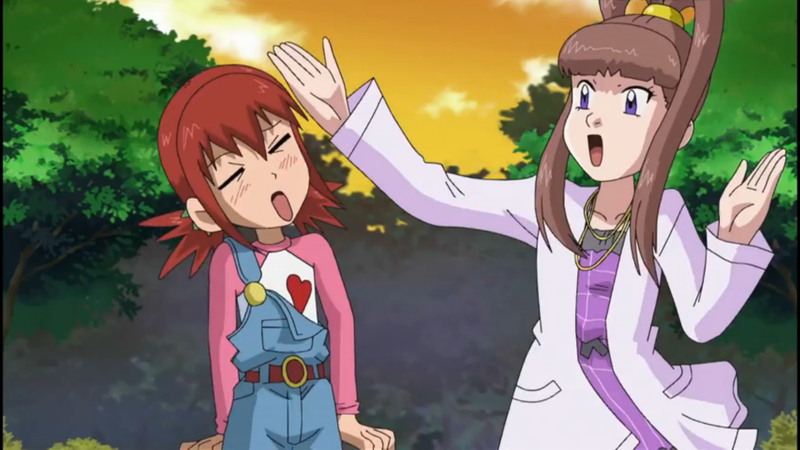 One of the few legitimate criticisms of the stretch run of Tamers was its lack of any sunshine. Getting her into at least a moderately sociable mood is a big step forward. The second big note is that Angie actually does something worthwhile, and it actually gets recognized!While Jeremy fawns over the hot girl and Mikey doesn't have time for anyone's feelings (which he even kind of admits), Angie seems to be the only one taking an interest in Nene's emotional well-being. She notices that Nene never smiles (the sly grins when she was in her “I'm mysterious!” mode apparently didn't count) and gets worried. It's consistent, as Angie still seems to be the only one of the three emotionally affected by their “separated from family in strange dangerous world” problem. She might be the only one equipped to help Nene, and it's nice to see her show sympathy and do so. The logic's pretty spurious, but maybe all this was what the Monitamon meant when they said visiting Warrior Zone was the best way to help Nene. Nene's Monitamon seem to be the only ones without sporty colors. It's sort of like the opposite of Pokémon episodes where one of Ash's team meets more of its type and suddenly gains a tertiary identifier like sunglasses or a hat. Something about seeing living computer monitors swimming underwater looks like a major hazard. Jeremy fantasizes about rescuing the zone's princess, suggesting that his thing for Nene is little more than some moe fantasy about helping ladies in trouble. And did anyone notice Jeremy feeling up Nene's chest during the cliff debacle? While Jeremy prods Mikey to come up with a brilliant plan to scale the cliff, he repeatedly flicks Mikey's goggles, usually Mikey's tell that he has come up with a brilliant plan. Etemon is ridiculous and annoyingly musical enough here that it's a shame they didn't get the original voice from Adventure. The weird part is that they did get the original voice actor. Yep, Fusion Etemon is also voiced by Richard Epcar, but they went a different direction... which kinda sounds like Myotismon (also Epcar) with a southern twang. Angie has this odd blush when she's questioned about her concern for Nene, which suggests that Angie is either more tsundede than we all though or she also has a crush on Nene. 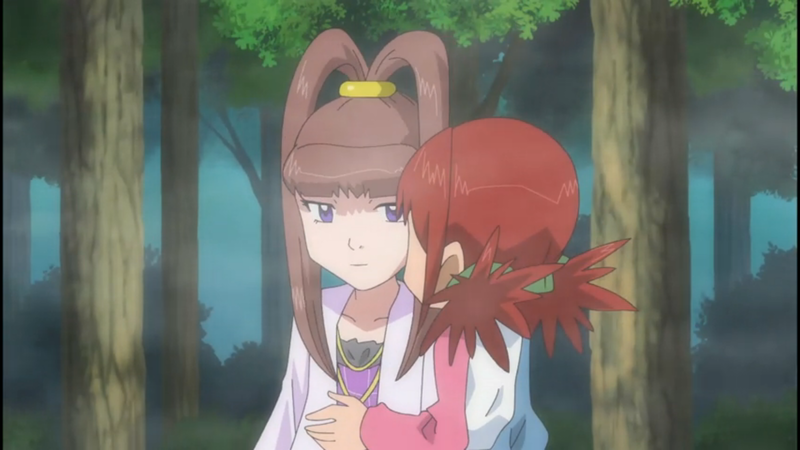 For what it's worth, Angie was also feeling up Nene's chest early in the episode. "who would just assume catch up"
That's "who would just as soon catch up". Given the context though, I'd rephrase it to "who would sooner catch up"
"No soup for you!" Shoutmon? More like SoupNazimon!